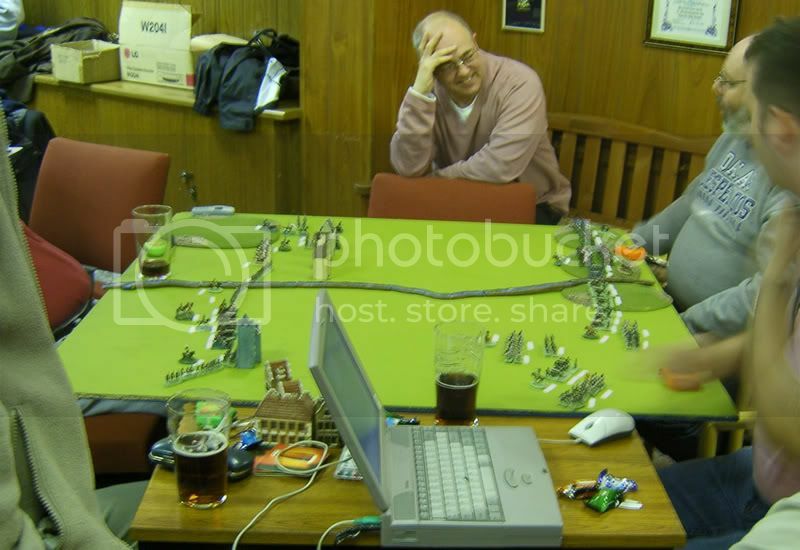 As promised, some shots of the Warhammer ancients game I ran to show a chap the rules in the week. Here you can see their opening dispositions; a solid mass in the centre, with the Hird on the commanders' right, next to the bowmen and the Jomsvikings in the rear. 24 Milites, dismounted Representing the Thuringians, who though armed and armoured as milites, tended to fight on foot. 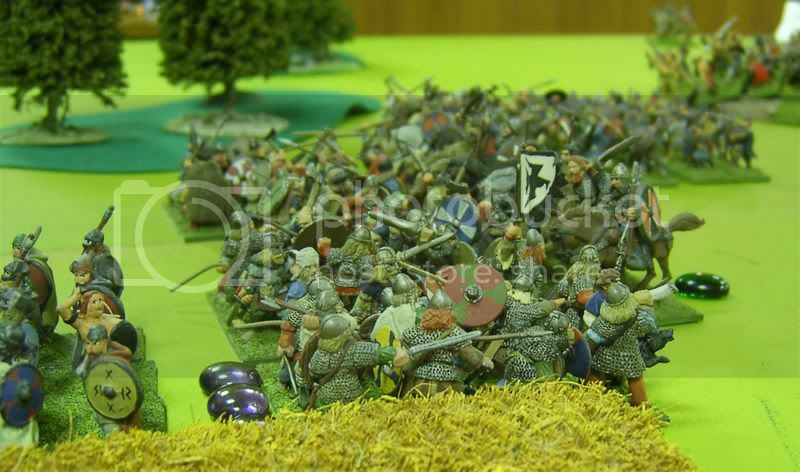 At first the Vikings were tied down by the narrow field of deployment they had; Their advance was reduced to a crawl, except for the Ulfhendhar on the left. However I was more concerned with crashing my cavalry into his flanks and, to ensure all the possibilities of the rules were investigated, a frankly insane frontal charge against his massed line. About the same time his Ulfhendhar tried to smash a unit of Liberi on the hill, but their shieldwall held and the remants of the wolf warriors were caught and wiped out. Although in the centre I delivered a juddering blow to the Vikings they held, and the double handed axes in the line sent horse and man to the ground; the cavalry broke like a wave on the prow of a longship. Worse still on the flank my charge against the Viking bowmen was lost before it even made contact; shot asunder on the way in. 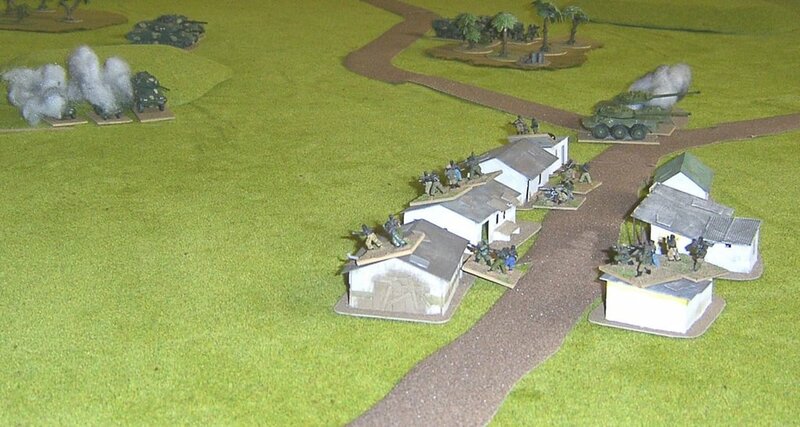 However, with my right flank cleared, I was able to come down from the hill, and got my infantry to the fore. Here the spears sung a song of blood (ooh, getting very warhammer here now aint it!) the Vikings could not raise a voice to. One bondi unit scattered, the other was killed where it stood, but it was a high water mark for me. Momentarily it looked as if the Vikings were lost, but their Jarl ruled his hirdmen with spirit and skill and drove the Thuringians into the ground. At the end the vikings had their best two units holding the field with their valiant bowmen still peppering my surviving cavalry, and one unit they could at least hope would rally. I could only count on my lords' cavalry, one unit of Liberi and one scattered band of coloni, trying to trade shots with the Danish bows. For a change I had time to grab a couple of shots of the other games on that night too. 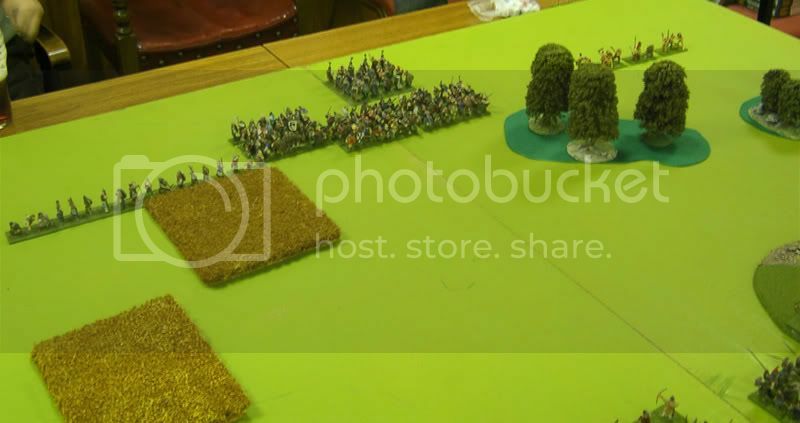 There seemed to be a reasonably healthy turnout on the night, 16-20 players and hangers on. 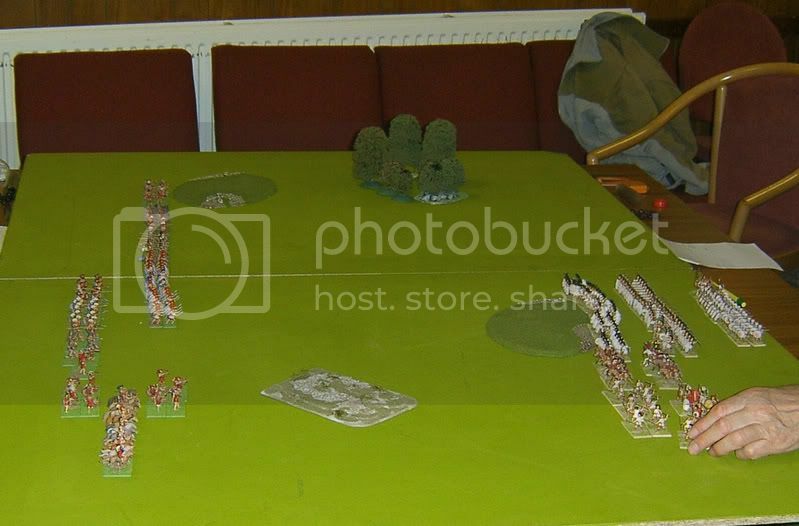 Below is some sort of computer moderated napoleonics game, not my personal cup of tea (15mm, needs a laptop to play, didn't see anything move or any dice get thrown) but seemed to support a number of players. Two other guys were doing Warhammer skirmish, Orcs trying to capture a Brettonian watchtower. Next time, I think I'll roll out the 28mm WW2 and the Operation Overlord rules, by Alto Zero. I think I've done enough ancients of late. A game at short notice, resulted in AK47 being dug out again at my house. Having amassed a huge collection of models and figures I let my two players select their own armies to any form the rules allowed; the end results being a Dictatorship, and a superpower backed state. 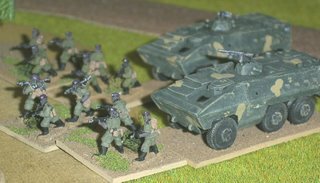 Chris' natural instincts for modern games saw him on the aggressive side with a force of armoured cars, tanks and mechanised infantry at the start. Phil, more at home with ancients and napoleonics, set himself a defensive task, initially equipped with tanks and militia troops holed up in and around a village. Chris' flanking infantry captured one objective unopposed, but in the centre the armoured battle seemed to swing in the favour of Phil, who destroyed three afv's for the loss of only one of his own. Reserves began to flood in as time ran out, Chris had well equipped and determined infantry arrive to the south of the village; Phil had truck-borne regulars move to intercept them. However in a tactical blunder the lorries were caught in the open, battered by fire and then obliterated by a close assault, the last defending tank to the north was destroyed, and in the end only the militia held out in the village. By the terms of the rules it was a crushing victory for the attackers under chris. All in about two hours. With time on our hands we even managed to fit in a came of cards, Nuclear War that is; a morbidly fun game in which the last man standing is not so much the winner as least defeated. 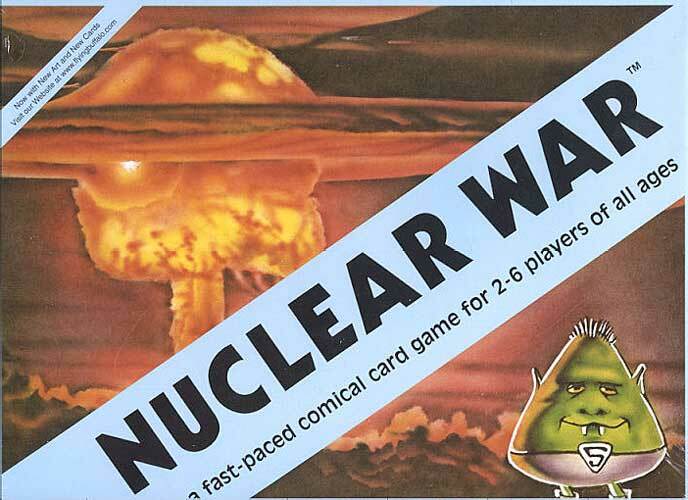 you quickly get into the psyche of trading shots of ICBMs and attacks by stealth bombers with one another. How this hasn't been converted to a Collectible game overthe years I don't know. How fast can you produce reasonable figures in bulk? I often wondered, especially as I'm accused by others of being a ridiculously fast painter. It's certainly an advantage that my painting table is a permantnet feature of the living room, in plain sight of the TV, HIFI, PC and Wife! Hardly an evening goes by without an hour of painting (except Saturdays I guess), so results can appear to come pretty fast to others who paint maybe only on sundays, or that one night a week they're allowed to set the painting table up. Still, it doesn't mean the result will be any good. 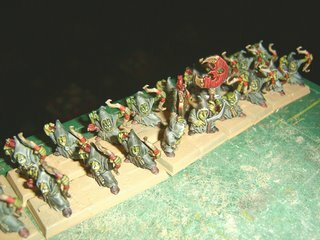 The common answer to the question 'how do I get good at painting model soldiers' as asked on any number of forums and in magazines, is always some variation on 'paint 500 bad ones first'. None the less how long does reasonable tabletop quality take. To find out I timed a set of figures from start to finish. 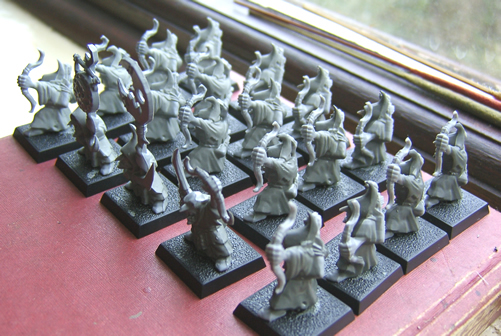 The figures in question being 20 goblin archers from the latest Warhammer boxed set. Clipped from the sprues, the figures were slotted into the bases and painting began. They were not glued into the bases, as I intended to both multibase and randomise the positioning of the figures later. 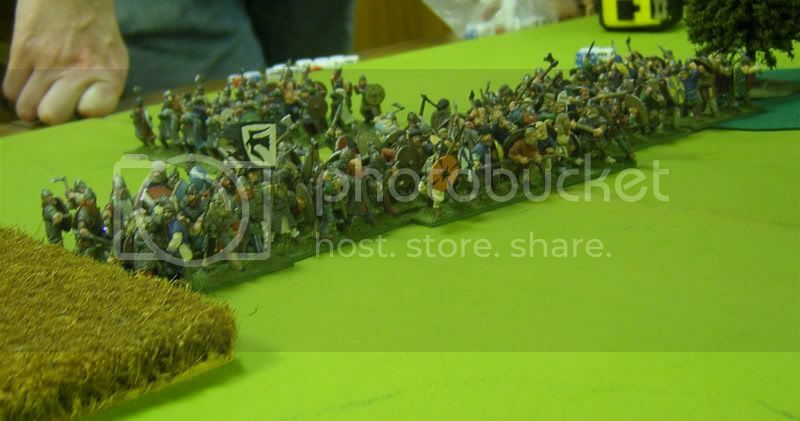 The troops were laid out in the 5x4 block with a variety of poses in each row, then each row had its' robes painted a different shade of grey; starting with the lightest shade, and gradually adding more of a darker grey to the mix for each row until all 20 figures were done. I tend to start figures by painting the largest area of colour first, usually this means the main uniform, on ancients figures it is often the flesh, on moderns the fatigues. 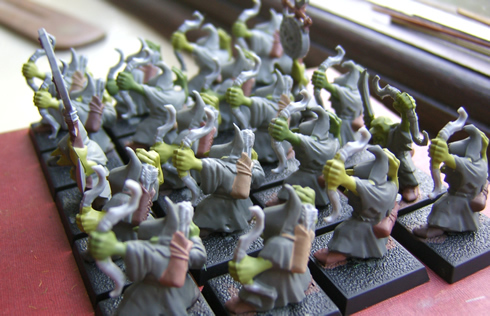 Next for the goblins was the flesh tone. 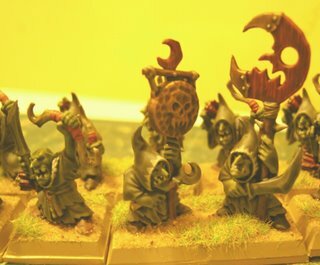 On goblins, I like to vary the flesh tones, and although I've never bothered with doing so on human figures the principle that skintone varies greatly would still stand true. The method is basically the same as for the grey robes, but this time with a mid green base lightened with Yellow and Cream through teh columns rather than the rows; to avoid them all matching the command group were shuffled along ther rows at this stage. I was neat were the edges met the grey, but not anywhere else. To this point the process has taken a total of two hours from out of the box. Next the bows, belts, straps teeth and other details were despatched. The figures were entirely base coated in under three and a half hours out of the box. 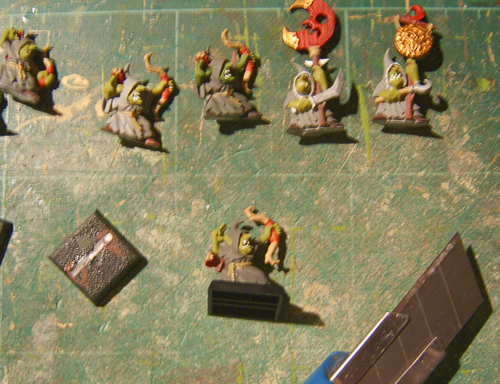 Next the figures had to be carefully cut off the slots, which were then reglued back into the bases. It's a bit of an art to get right, and results can vary, I certainly put in more tint than I like on these chaps, but the results are instant and magical. Just slop it on, and the figures are transformed. It can be worth using a clean brush to draw of excess pigment if it is building up in blobs at the bottom of the figure. Lastly in this shot the bases have been given a coat of of sand brown paint. For finishing, a layer of wood glue was applied to the surfaces of the bases, and they were dipped in fine playpit sand, a second pass was used to add patches of GW/Noch static grass (Noch is a model railroad company; I suspect they supply GW its' scatters, but from source they cost half the price). Last of all the bases get a second coat of sand brown paint; and they're done! From start to finish the unit has taken just 5 hours, to do everything, that's 300 minutes, which works out at 15 minutes per figure. Bear in mind tough you have to allow for drying time at several points, notably the filler, varnish wash and basing stages; the painting itself allows me at least to work with wet colours, but you have to still take comfort breaks. In all the figures were onto and off of the painting table in 6 days. As you can see from the command group above, there was still time for some detail in the unit, I was able to do the eyes with highlights, pick out the teeth, give the command group some personal details and spend a little time on the standard. The key to this technique, beyond being fast is simply to be neat and light of touch. Better to ned two strokes of the brush to put a belt in, than to make a messy blob of it in one go. 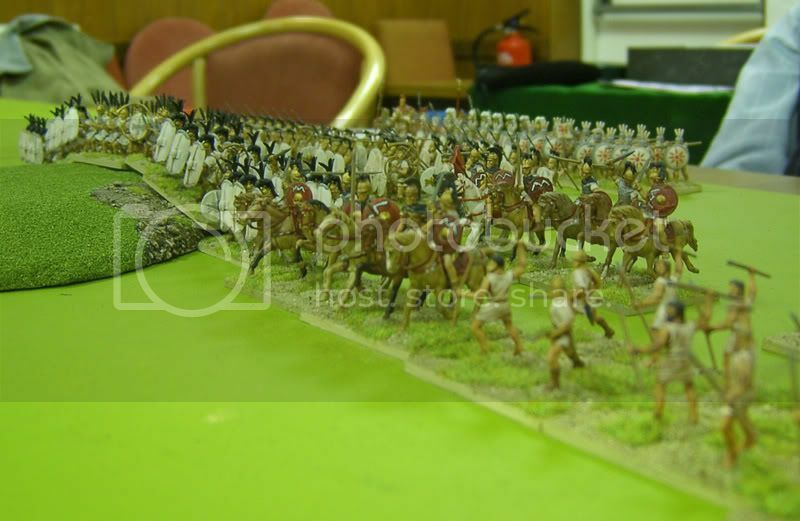 Of course practice helps, as does having all the right kit available, but it is a perfectly reasonable timescale for producing straightforward wargames figures, whether fantasy or historical, 28mm, 20mm or 15mm! Airfix & Humbrol have been saved by Hornby you may have seen over the weekend. Of course Hornby itself is hardly on the cutting edge of it's own hobby, though they make enough money to pay the pittance Airfix was up for; £2.4m seems very cheap for all their assets to me. To be fair to Hornby too my brother, who'se into trains, assures me that recent Hornby product has seen heavy investment to bring it up to it's competitors standards, whilst wisely pitching at the 'Memory lane' market. I think it could be the shot in the arm Airfix need. But on the positive side for me, it means I don't need to start using water based paints just yet. Hoorah! OK, so for a bit of variety I took Armarti to the Leeds club this past week. It was another opportunity to 'display my wares' so to speak, and Armarti as a set of rules have the advantage of being very simple to run through in an evening, even with players who've never played the game before. As makes sense, I'd preselected a couple of matched armies - Early Roman Republicans, and Etruscan Greeks (i.e Greeks with a warband ally for novelty value, a simple tweak of the Armarti Greek list). Once the players had the basics of units explained they deployed based on their map plans. Armarti is dependant on the map deployment, like historical generals of the time players plan the fight with no idea what the enemy will do for sure; I wish more games used so simple a method, it produces fascinating results. Here the Etruscans deployed wide, whilst the Romans deployed deep and entirely refused their right flank. Battle commenced and the Romans moved aggressively to try to outflank the Etruscans. 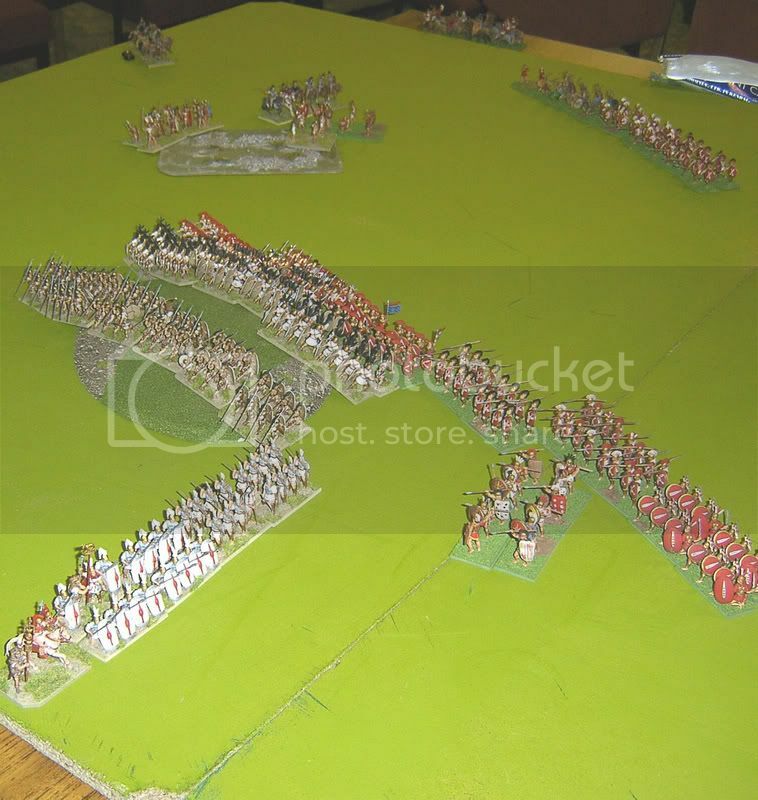 Armarti dictates armies have a fixed number of available formations in a game. This limits tactical flexibility. The less flexible Etruscan army had to deploy a huge line, which spent the early game redressing to face the enemy. The Cavalry battle eventually went the way of the Romans, though the horse were battered, their commander tried in vain to rally them. Eventually chosing to attack the Etruscan psoloi in the rough ground. An error as psoloi fight at their best in difficult ground - each unit has three combat factors, one for fighting in good going, one for difficult ground and one for being hit in a flank; in this case foot troops are better han cavalry in rough going. This as a result allowed the psoloi to hold the Roman flank attack up, whilst the phalanx closed with the Roman centre. 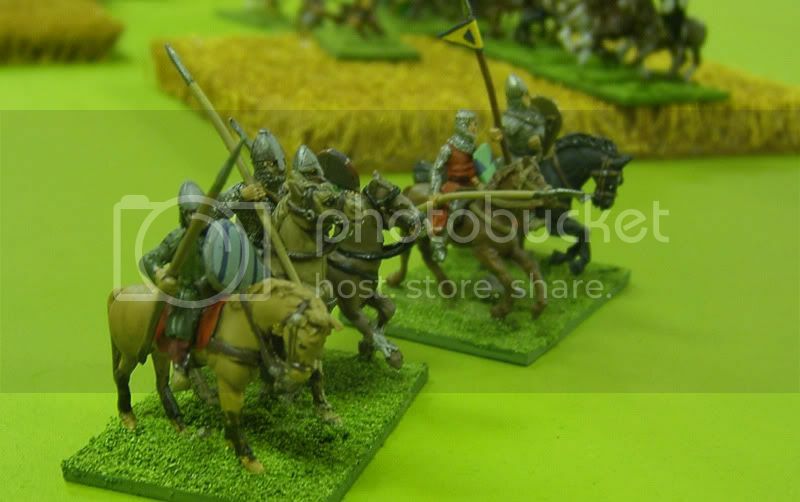 The figures used were from my extensive 20mm ancients collection. A mixture of Zvezda, Hat, Nexus and Revell in this case. Late in the day the Etruscans clashed with the Princeps in the centre. At the rear the Etruscan general was lost along with the warband, to a cavalry charge in its' flank. In the end the Etruscans crumbled first in the cantre, largely through not being willing to attack the available flank of the Romans. It was a straight 5-0 break point victory to the romans. Armarti is a good game, hampered mainly by only being suitable for stand-up fights. It is however quick to play once you are familiar with the conventions it uses you can get two games in, in the shortest of evenings. My figures attracted a fair deal of favourable responses too, which is always nice!